The Maine lobster is said to be the most flavorful of all the lobsters because it comes from the pristine, icy cold waters of the North Atlantic. They have a firm texture, are naturally big and plump, and go perfectly with a tender cut of filet mignon. Two Maine Lobster Tails, 6-7 oz. each. Two Premium Cuts of USDA Choice Filet Mignon, 6 oz. each. Cooking Instructions & Recipe Booklet. Shipped in a Styrofoam cooler with Frozen Food-Safe Gel Ice Packs. Shipping Rules: The dinner will ship via Next Day Air or Second Day Air. UPS may arrive as early as the day before the selected delivery date and no later than 7 PM of the selected delivery date. We are unable to ship to Maine or New Hampshire due to state laws. 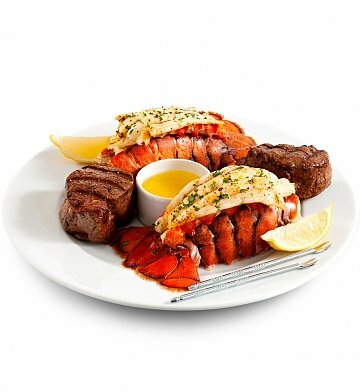 Surf and Turf is a hand delivered gift. These gifts are delivered by one of our local design centers located throughout the United States and Canada. Same day delivery is available for most gifts when ordered before the cutoff time. The cutoff time for Surf and Turf is in the recipient's time zone. 100% Sustainable Lobster Tails and High Grade USDA Choice Beef. Featured in Oprah, Rachael Ray, USA Today, and Wall Street Journal. Delivered in a Styrofoam cooler with frozen food-safe gel ice packs. Exceptional quality and will be using your services again. My gift was delivered on time. And was considered the best gift by the recipient that he had ever received. Thank you got making me look good.